BEIJING--Lena Schoneborn of Germany clinched the women's modern pentathlon title in 5,792 points at the Olympic Sports Center here on Friday. 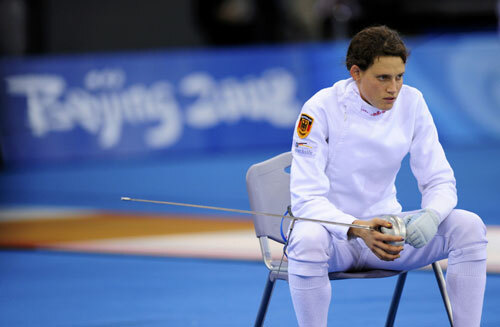 Schoneborn, ranked third in the world, came 20th in the shooting before winning the fencing to top the overall ranking and never gave the lead away since then. Australian Heather Fell, 24, placed highly at this year's European and world championships, came in second 10 seconds trailing the titlist with 5752 points. Fell finished fifth and fourth respectively in the two championships. Victoria Tereshuk of Ukraine won the bronze in 5,672 points, taking the advantage of a strong rally in running. She was in sixth place before the last discipline. World No. 2 Aya Medany, 19, form Egypt was second overall on 2,072 points after coming joint eighth in the shooting and joint fifth in the fencing, but a poor swimming result downgraded her to eighth overall. Belinda Schreiber of Switzerland, ranked No. 38 in the world, won the shooting with a score of 188, but dropped to eleventh overall. Pre-game favorite Amelie Caze, 23, finished a lowly ninth for weak shooting and running. The tall French school teacher, 23, has earned her favourite's tag the last two seasons, in 2007 and 2008, when she twice won the world championship title, in Berlin and Budapest. She is now ranked No.1 by the International Modern Pentathlon Union (UIPM). Anastasia Samusevich of Belarus narrowly missed the podium with eight seconds adrift. Samusevich slipped from joint third to joint 17th overall after coming 33rd in the pool, but a leading run result earned her place back by big margin. China's Chen Qian took the fifth place as she managed full mark in horse jumping and a remarkable run.